Multnomah County Library is one of the two library systems I currently use the most. Recently I found myself at the Holgate branch, one of the two branches within two miles of my house, and the bins of zines near the front entrance caught my eye. Multnomah County Library is possibly the only major city library with a sizeable zine collection (at least I’m not finding any others…chime in below if you know of others!). The collection is spread across six libraries, and they’re even patrons of mine—the library collection includes Beyond the Gate (which seems to be a fairly popular circulating title!) and another zine I contributed to a few years ago. Naturally it was difficult to leave the library without something to take home and read, so I quickly snapped up eight titles. Two of them really stood out for me. 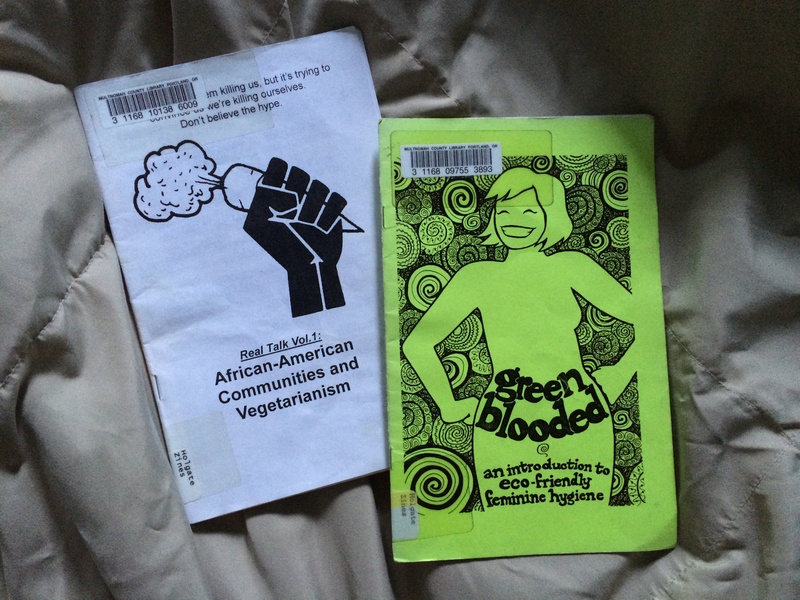 This zine encourages African Americans to work toward vegetarianism. The author begins by outlining the life expectancy rates of African Americans compared to their caucasian counterparts, and discusses some misconceptions about the history of traditional or “soul food.” She offers up some personal history, but the facts do most of the work, including a price comparison per pound of various sources of protein. The zine is sparsely illustrated, so the author can pack in as much information (and recipes!) as possible. In Green Blooded, Cathy Leamy has written a short but entertaining piece about the variety of feminine hygiene products that you probably don’t know about. They’re far more eco-friendly than the things you can get at the grocery store, and way more pocketbook friendly. The illustrations are educational, fun, and at least once, a little gross. But the publication has great potential to reach people that may be otherwise missed…and for that reason, I’m quite excited about having discovered this zine. Have you read any good zines lately? Let us know what they are in the comments! “Beyond the Gate” Now at Multnomah County Library! And that’s how I discovered that Multnomah County Library has eight copies of my zine, Beyond the Gate: An Ethnic History of Portland’s Chinatown and Nihonmachi. And as of this morning, four of the seven circulating copies were marked as either checked out or recently returned. Whoa! That’s right, I’m held in one of the highest circulating libraries in the United States. No autographs, please! The larger mystery is how the library got eight copies—it sure wasn’t through me. Right before I left for Canada last August I dropped off a single copy at Central for their zine librarians to peruse, thinking if they were interested they’d contact me about obtaining more copies. I never heard a peep. This could explain why my zine keeps selling so well at Reading Frenzy. The listing dropped off the Powell’s database several months ago, and I assumed this was because it hadn’t sold—but perhaps they all sold at once, to one person! I’ve sent an email to inquire what I can. Perhaps the librarians navigated to this blog, saw where they could pick one up without hassle, and took a walk on their lunch break. Another take-away from this discovery: I’d better get cracking on producing my second title! Help Decide the Topic of My First Zine! Here’s your chance to influence the future. Yesterday I created my first mock-up of a zine (cover shown at left), partially to start utilizing the InDesign classes I took at the IPRC this winter, and partially to build my portfolio up a bit for future endeavors. Here’s where you come in, friend. I’ve come up with a few topics, but can’t decide which I should tackle as my first project. What would you prefer to read? • Walking tour of Chinatown, for a friend’s newsstand currently in development. • In the Kitchen, a zine of thoughts about food and cooking, recipes, photos, etc. • WWII Japanese internment camps. A lesser-known topic, but important. I have some good photos of the three I’ve visited, and there are plenty of public domain images available that Ansel Adams took for the United States government. • Bikes! Bikes are well-covered in the zine world and in Portland, so it would probably need to be more specific. Like doing bike moves, how to choose a bike, stories of people’s individual bikes, or something like that. Leave a comment below with your vote and thoughts. Next week I will take a look at the responses, and start moving forward with my planned production schedule. Thanks, friend!